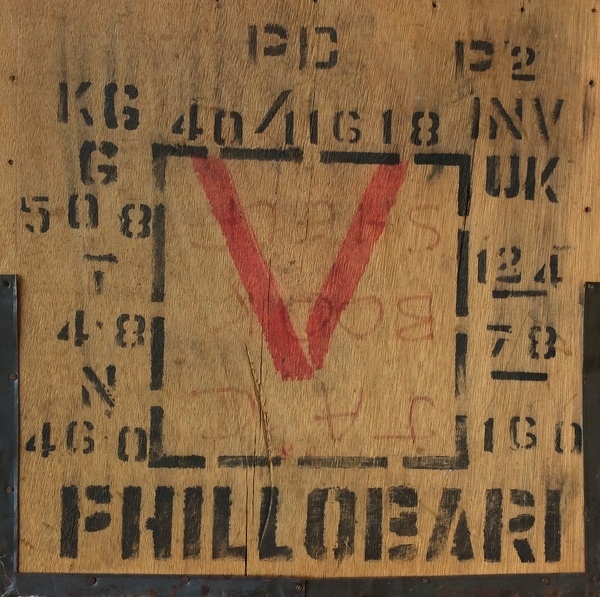 Like Marcel Duchamp Rowntree enjoyed creating Objet Trouvé - art produced from undisguised, often modified, everyday objects, in this case part of a tea crate from Phillobari an area in Assam, India. Pablo Picasso first publicly utilized the idea of Objet Trouvé when he pasted a printed image of part of a chair onto his painting titled Still Life with Chair Caning (1912). Marcel Duchamp is thought to have perfected the concept several years later when he made a series of ready-mades. Lettering played a key part in the creation of Objet Trouvé. Like several of his contemporaries, John Piper in particular, Rowntree loved incorporating decorative lettering in his compositions.